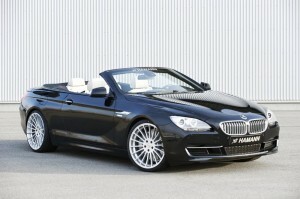 For the complete package Hamann has prepared for the BMW 6 Series Cabrio F12 you have to wait until Frankfurt Motor Show. But here’s a kit for those who can’t wait. This package includes new set of wheels which you can choose from a wide range of available models and sizes, sport suspension, a few interior upgrades and sport exhausts. The full package will also include a body kit and performance upgrades. For the wheel arches, customers can choose from 21-inch alloy wheels in DESIGN EDITION RACE “ANODIZED” with high-gloss chrome-plated rim flange, black spokes and titanium screws or DESIGN “ANNIVERSARY EVO” wheels in silver or matte black, available in 20 or 21-inch format. HAMANN Motorsport also offers the DESIGN EDITION RACE matte black wheels in a 20-inch version. All wheel designs can be ordered individually or as a complete set and are fully compatible with the tyre pressure sensors fitted at the factory. In order to set the stage even better for the alloy wheels, HAMANN Motorsport has lowered the centre of gravity of the BMW 6 Cabrio (F12) by around 30 mm at the front and around 25 mm at the rear using progressive suspension springs. HAMANN has also given the engine of the 650i Cabrio a sporty soundscape. To this end, its tuning professionals have installed a stainless steel exhaust system consisting of a four-pipe exhaust system with round 90 mm tailpipes and a middle silencer. The car’s interior is upgraded by way of aluminium pedals and a footrest, available either in silver or anodized black. Black foot mats with a silver HAMANN logo are available as an optional extra to add a finishing touch of class to the car’s sporty cockpit.